No maint. fees for 1 year! 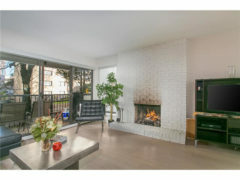 Excellent opportunity for first time buyers to get into a big affordable West End 2 BR Strata apt. Very spacious 936 SF NE corner apt w/outlook to pretty tree-lined street. Close to Nelson Park & dog run for Fido & Lord Roberts annex for the little one. Room for your big comfy sectional in the 13’x15′ living room w/a real wood burning FP. Outdoor balc for green thumbs & BBQ. Sep dining area w/corner window. King size plus BR w/room for a full suite of furniture. 2nd BR for child, guests or home office. Bring your Ikea catalogue & make it your own! Pro-active strata. New roof, plumbing redone – bldg repainted. Pets ok. EZ to show.